Brevard County turns off its lights during turtle nesting season. No big deal you say? Can you see the implications? Can you imagine the ramifications? To me, it shows a deeper story, a profound quality that sets us apart from so many other communities. To me, it shows that there is yet hope. A community has come together, and with just a little intentional action we have made a difference. This tiny news-bit is what started GreenBrevard. The concept that together we can do something collectively good is a powerful idea. I’m amazed that Brevard cares enough to help preserve sea turtles for future generations. To me, it is evidence that we can rise to the occasion, that all hope is not lost. Florida’s east coast is a very important place for sea turtles, and Brevard is home to several species. The beaches are where they instinctively return to lay their eggs and make new baby turtles. Nesting season runs from May 1 through Oct. 31 every year. Several years ago, we determined that light from beach communities was confusing new hatchlings, sending them into the streets of A1A rather than into the Atlantic. It’s important to reduce ambient light during the nesting season. Brevard’s residents, businesses and government responded in a big way to this need, and ordinances and public support have produced more than compliance. The biggest change in our community is an awareness of these endangered creatures and a willingness to care about their future. • Keep beachfront lighting turned off. • Reduce the number of lights near nesting beaches. • Reduce light reaching the nesting beach. • Place security lighting on motion-sensitive switches. • Apply dark window tinting to windows. Brevard County’s beaches are the largest nesting site in the Western Hemisphere for loggerhead sea turtles, with more than 20,000 nests per year. Approximately half of all green sea turtle nests in the United States are are found along Brevard’s beaches. 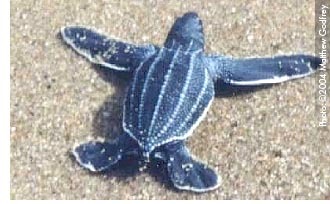 Leatherbacks lay the fewest nests of the three species (53 in 2003), but the number has increased in recent years. Although storms and hurricanes did damage in 2004, sea turtles will continue to come back as long as we’re each willing to do a little.